The purpose of this project, undertaken by Piotr Bojakowski and Katie Custer Bojakowski is to study the timbers, analyze the remains, and reconstruct the structure of the late 16th-century Western Ledge Reef Wreck, aka Santa Lucia, (site IMHA 3) from Bermuda. Unlike other 16th-century Caribbean parallels such as the Highborn Cay Wreck from the Bahamas, the Molasses Reef Wreck from the Turks and Caicos Islands, or the San Esteban Wreck from South Padre Island, the preservation of timbers and artifacts from the Western Ledge Reef Wreck is phenomenal for the tropical waters of Bermuda. With the exception of the bow section, the wreck consists of almost the entire bottom of the vessel. This includes a keel, remarkably preserved keelson with a mast step and 6 buttresses, 14 floor timbers with characteristic dove-tail mortise-and-tenon joints, 21 first futtocks, external planks, ceiling planks, but most of all the entire stern assembly. The provisional research indicates that the Western Ledge Reef Wreck was excavated and recorded between 1988 and 1991. This work was carried out by both Texas A&M University (1988-1990) and East Carolina University (1990-1991). During the summer of 2007, Bojakowski and Custer-Bojakowski returned to the site to evaluate the condition of the timbers and study the excavation records. Based on an inventory, there are at least 125 individual timbers, which correspond to the original timbers stored in three protected outdoor tanks at the Bermuda Maritime Museum (BMM) grounds. Although the research still continues, the results of this project will constitute a crucial part of Bojakowski’s doctoral dissertation. Adams, J. 2003, Ships, Innovation and Social Change: Aspects of Carvel Shipbuilding in Northern Europe 1450-1850, Stockholm: Stockholm University. Arnold, J.B. III & Weddle, R.S. 1978, The nautical archaeology of Padre Island: The Spanish shipwrecks of 1554, New York: Academic Press. Baker, M. , Fragments of Ancient English Shipwrightry, pl 2820, transcribed by Robinson, M.S., Cambridge, Magdalene College, Pepys Library. Barata, J. da G.P. 1989, Estudos de arqueologia naval, Vol. I, Lisbon: Banco do Fomento e Exterior. Bojakowski, P. 2009, ’The Santa Lucia: Research into the Identity of the 16th-Century Western Ledge Reef Wreck, Bermuda,’ ACUA Underwater Archaeology Proceedings. (eds.) Laanela, E. & Moores, J. An Advisory Council on Underwater Archaeology Print. Bojakowski, P. 2008, Studying the Santa Lucia, MARITimes 21(3). Breck, P. 1965 (3 July), ‘Spanish Wreck Found off Bermuda’, Bermuda Sun. Crisman, K.J. & Garcia, C. 2001, ‘The Shipwrecks of Angra Bay, 2000-2001’, the INA Quarterly 28.4, 3-11. Fernandes, M. 1989, Livro de traças de Carpintaria (1616), Fac-simile, Lisboa: Academia de Marinha. Garcia, C. & Monteiro, P. 1998, ‘The excavation and dismantling of Angra D, a probable Iberian seagoing ship, Angra Bay, Terceira Island, Azores, Portugal: Preliminary Assessment,’ Interational Symposium on Archaeology of Medieval and Modern Ships of Iberian-Atlantic Tradition, Lisbon. Grenier, R. et al. (eds) 2007, The Underwater Archaeology of Red Bay: Basque Shipbuilding and Whaling in the 16th Century, Vol. I and III, Ottawa: Parks Canada. Guérout, M., Rieth, E. & Gassend, J.M. 1989, Le navire génois de Villefranche: un naufrage de 1516?, Paris: Ed. du Centre Nat. de la Recherche Scientifique. Keith, D.H. 1985, ‘Analysis of Hull Remains, Ballast, and Artifact Distribution of a 16th Century Shipwreck, Molasses Reef, British West Indies’, Journal of Field Archaeology 12:4, 411-424. Marsden, P. (ed.) 2009, Mary Rose: Your Noblest Shippe: Anatomy of a Tudor Warship, Vol. 2, Portsmouth, England: Mary Rose Trust. Morris, W.J. 1993, ‘The Preliminary Analysis of the 16th Century Remains Recovered from the Western Ledge Reef Wreck, Bermuda’, Bermuda Journal of Archaeology and Maritime History 5, 58-69. Oertling, T.J. 1989, ‘The Highborn Cay Wreck: The 1986 Field Season’, International Journal of Nautical Archaeology 18:3, 244-253. Oertling, T.J. 1998, The Concept of the Atlantic Vessel, Proceedings to the International Symposium on Archaeology of Medieval and Modern Ships of Iberian-Atlantic Tradition, Lisbon. Rosloff, J. & Arnold, J.B. III 1984, ‘The Keel of the San Esteban (1554): Continued Analysis’, International Journal of Nautical Archaeology and Underwater Exploration 13:4, 287-296. Watts, G.P. 1993a, ‘The Western Ledge Reef wreck: a preliminary report on investigation of the remains of a 16th-century shipwreck in Bermuda’, International Journal of Nautical Archaeology 22:2, 103-124. Watts, G.P. 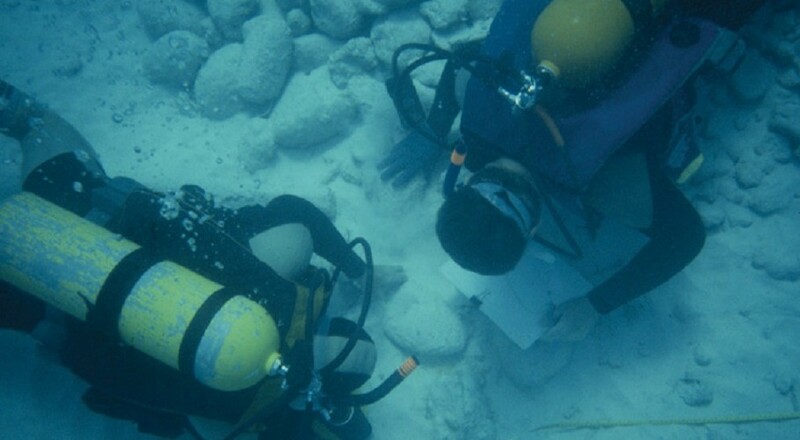 1993b, ‘Investigation of the 16th Century Shipwreck on Western Ledge Reef: 1988-1991’, Bermuda Journal of Archaeology and Maritime History 5, 34-57. Watts, G.P. 2003, ‘A Second Decade of Shipwreck Research in Bermuda,’ Bermuda Journal of Archaeology and Maritime History 14, 61-147. 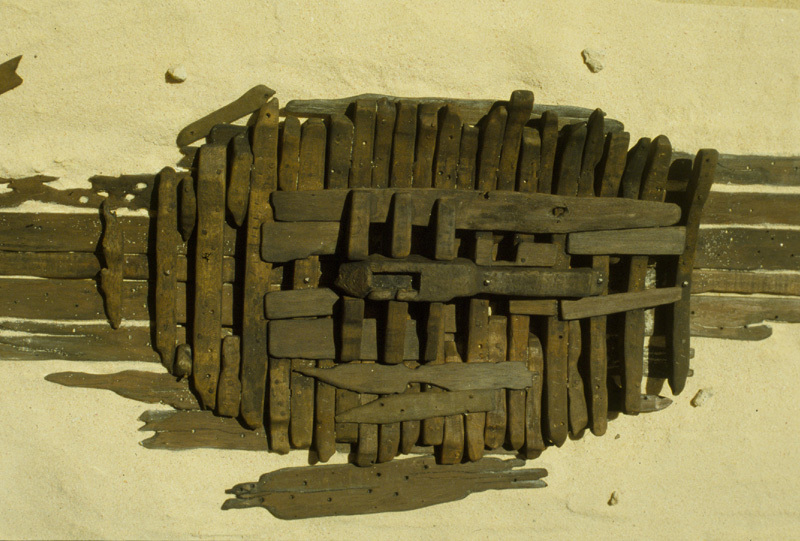 ABOVE: Model of the wreck structure (photo courtesy of the BMM).